Great Britain's double Olympic gold medallist Mo Farah will compete for England at this year's Commonwealth Games in Glasgow. "Hi guys! I will be running in the Commonwealth Games this year. See you in Glasgow," he tweeted. He added: "Haven't decided which events to compete in: 1500m, 5,000m, 10,000m. Will let you know as soon as I decide." Farah, 31, was eighth in April's London Marathon and was undecided whether to return to the track in Glasgow. His coach, Alberto Salazar, advised him not to run any more marathons until after the 2016 Rio Olympics. The announcement is a boost to Games organisers, with Britain's Olympic heptathlon champion Jessica Ennis-Hill absent because she is expecting her first baby and sprint champion Usain Bolt yet to commit. 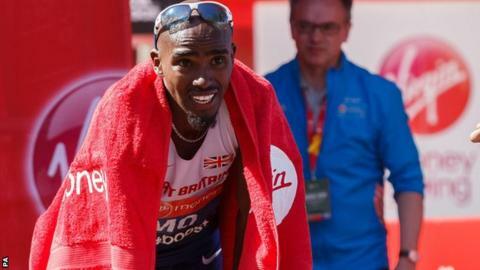 Farah won the 5,000m and 10,000m double at London 2012 and broke Steve Cram's 28-year-old 1500m British record last year before turning his attention to the marathon. Despite finishing four minutes behind winner Wilson Kipsang in the London Marathon, he said immediately after the race that he intended to run more events over the distance. Farah is scheduled to run in a special event at the Diamond League meet in Glasgow on 12 July, with the Commonwealth Games commencing 11 days later. Depending on which event he decides to run, Farah could be in action on Sunday 27 July in the 5,000m, and Friday 1 August in the 10,000m or the 1500m. Farah finished ninth in the 5,000m in the 2006 Commonwealth Games in Melbourne, but withdrew from 2010 event in Delhi, India due to fatigue. His experiment over 26.2-miles has led to speculation he may attempt the 10,000m and marathon double at the Rio Olympics.